Q. How do I know if I need to be evaluated for a sleep disorder? A. Talk with your primary care physician or internist about your symptoms and they can refer you directly to the sleep center, or to a sleep specialist. Some of the common symptoms people with sleep disorders describe are snoring, waking up gasping for air, daytime sleepiness, fatigue, insomnia, or nighttime leg restlessness. Q. How do I schedule an appointment with a sleep specialist at Rockland Pulmonary & Medical Associates? A. You can call Rockland Pulmonary & Medical Associates at 845-689-9141 to schedule a sleep consult. If it is determined that you need a sleep study to make a diagnosis, this will be scheduled during your visit. Please obtain a referral if needed prior to your visit. Q. How long does a sleep study take? A. The test is performed during the night while you are asleep. You will need to arrive at the center by 8:00 PM and spend the night in the lab. At this time, different body functions are measured, including breathing patterns, heart rate and rhythm, brain waves, eye movements, leg movements and oxygen levels in the blood. These are recorded with electrodes attached to the body. Technicians will monitor your sleep all night while gathering data. The tests are usually finished by 6:00 am the following morning. The collected data are forwarded to your physician to determine if you have a sleep disorder. Q. Can I take my usual medications on the day of the sleep study? A. All sleep aids being taken should be discussed with a physician before making an appointment for a sleep study. However, unless instructed by a physician, patients should continue to take all regular/daily medications on the day and night of the sleep study. Q. How do I obtain my sleep study results? A. A follow-up visit should be scheduled about 3 weeks after completion of all testing. In some cases, this may mean you would have two separate sleep studies and two separate follow-up visits. A follow-up visit is usually about 15-30 minutes, and at that time you can discuss treatment options with the sleep specialist, and may obtain a copy of your results for your own records. Results of your sleep evaluation test results, and follow-up care will be sent to your primary care physician as well. Q. If CPAP is prescribed, who supplies the machine? A- All CPAP units and supplies are provided by a homecare company through physician prescription. Rockland Pulmonary & Medical Associates will coordinate the ordering of your CPAP machine and replacement supplies. The homecare company will contact your insurance company for authorization and any possible out-of-pocket cost. The homecare company will then call you to discuss your insurance coverage and schedule an appointment with a respiratory therapist to instruct you on CPAP therapy in your home. Q. How often should I follow-up with my sleep specialist? A. 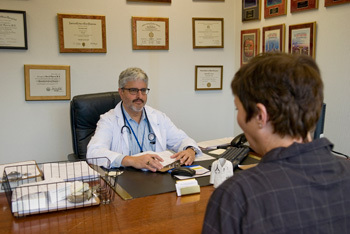 It is recommended that you follow-up yearly with your doctor to discuss any changes or problems. Replacement supplies can also be ordered during this visit.